I’ve learned a lot from the orchards this year surrounding vigor, and I feel like this course of study will be life-long. We get a lot of water here in southern Appalachia and while some apple varieties manage to sip this water, others gulp it and produce massive amounts of growth. You might be thinking: Growth! That’s wonderful! And it probably is if your tree is growing in a forest and needs to grow tall in order to reach the canopy and get some sun. But for an orchard, we have goals to harvest the crop and not the timber. When you are faced with a tree that has vigorous tendencies, the energy (sap) from the roots often rockets into growing new branches instead of growing new fruits. These vigorous tendencies of many heirloom apple varieties are part of the reason why you don’t see them at the grocery store or in orchards today. 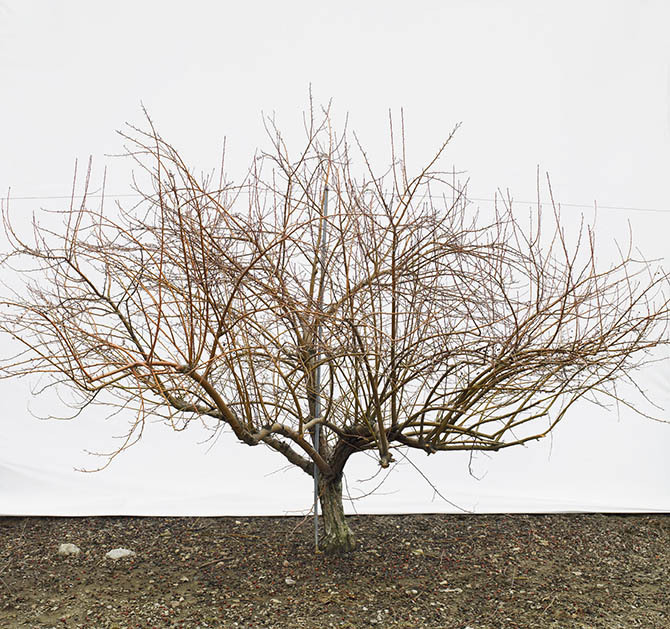 Vigorous trees are expensive to prune, often more susceptible to fireblight (a bacterial disease), tend to produce less fruit, and can’t be spaced as closely together due to being bushy. 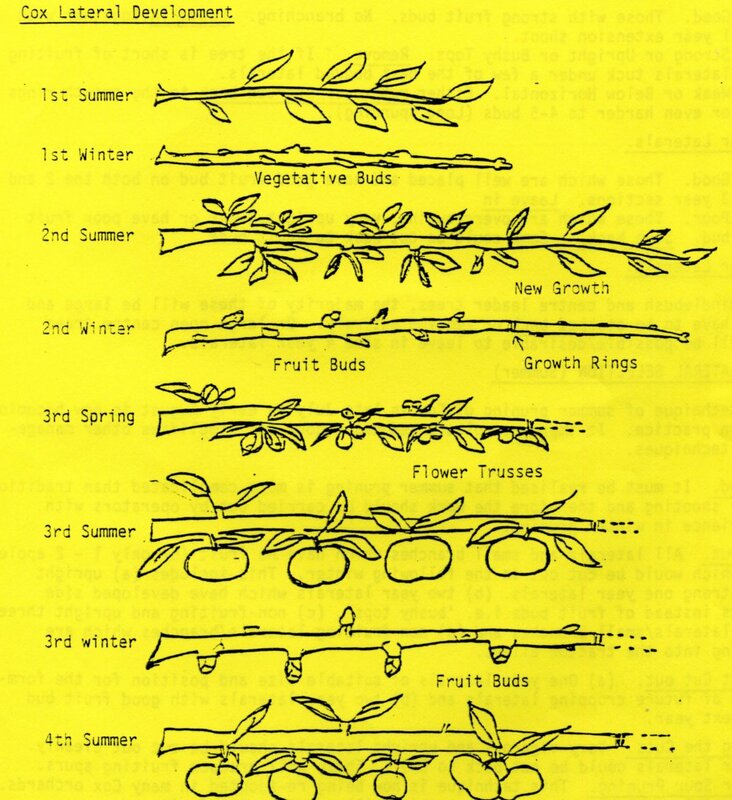 Each of these varieties are totally different apples and requires different management techniques. The difference between a black limbertwig and a roxbury russet is the same as the difference between me and my best friend from high school. In the end, we both need food, water and shelter…but its how we use that food, water and shelter which ultimately dictates our health and quality of life. Like the black limbertwig, I seem to thrive in poorer environments. Natasha, my best friend who represents roxbury russet in this analogy, most certainly thrives in richer environments where there is abundance. (She’s going to kill me if she reads this). This is the puzzle of heirlooms that I’m excited to spend my life trying to unlock. Where are these varieties happiest grown? What practical measures can I take to bring about more balance between vegetative and fruit growth? Site selection: You could argue the pros and cons for planting North, South, East or West until you are blue in the face. Rather than doing this in a blog, I’ll just tell you what I saw this year: South and Southwestern slopes are your poorest and driest sites due to the sun baking off water. At foggy ridge, we have a fairly steep south facing slope with rows of trees heading North-South. At the top of the hill where it is less sloped, vigor is higher than at the bottom of the orchard where the slope has steepened. This can sort-of be seen by a picture that I recently took of the trees with flushes of growth after a bunch of fall rain. The northeast corner, which is also the “flattest” land in the orchard, has tall shoots of recent growth, whereas the bottom southwest facing corner (that you can’t see) hardly has any flushed growth. Of course, these are different varieties and I’m just speculating here, but it’s a thought. 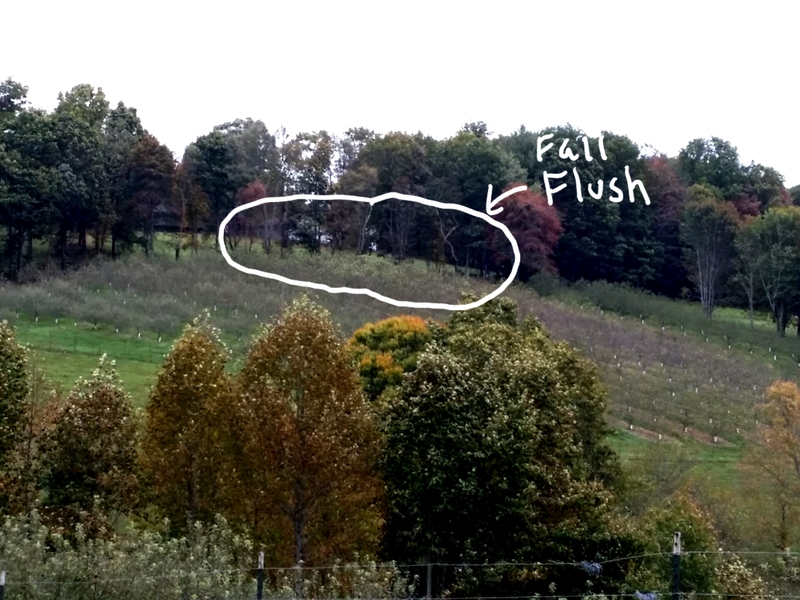 You might want to think through planting apples on contour if you live in a wet area with heavy soils and don’t know how the varieties will respond. That is, if you are going for fruit production. In Kyrgyzstan, the wild apples were growing on depleted, dry soils. Contour will help you to harvest nutrients instead of them flowing down slope, but could also result in gigantic half-barren trees. I won’t get into soil type, but that’s also important, if not the most important. Some apples want to be grown on sandy soils, others on clay soils. Some like wet roots while others like dry! The only way we’ll find out is if people start planting the same trees in different soil types. Rootstock Selection: We have now have a not-so-secret weapon that all those men at the pomological society meetings didn’t have 100 years ago. Dwarfing rootstock! The size of the root ball basically dictates how much water and nutrients the tree will get. Think of it like arteries. If you have clogged arteries (dwarf rootstock), your activities are limited due to a reduced blood flow and oxygen uptake. If you have totally clear arteries (standard rootstock), you aren’t restricted by blood flow and you can go run a marathon if you want. Let it be known, dwarfing varieties die much more quickly than varieties grafted to larger rootstocks (much like blocked arteries cause heart attacks which kill at an earlier age…to stick with the analogy). So, the thought goes like this: If I graft a very vigorous variety (V^3) onto a rootstock with a tiny root system, the growth would have to be moderated because those roots can only take up so much! Is this true? Well, partially. We’re learning, still. Thanks to the hard cider movement, people are actually grafting these V^3’s to dwarfing rootstock. Soon we shall see how varieties like harrison, a very popular cider apple (and the most vigorous variety I have EVER witnessed) grows for these people on a smattering of different soil types and rootstocks. I bet there will be a particular site somewhere in the US where Harrison can grow easily and without many inputs. It makes me excited to think about finding a true home for these varieties. To me, that’s the definition of terroir. That’s where young people are really important. The average age of an orchardist is in the high 50’s, low 60’s but I seem to meet a whole of of them over the age of 70. Many of these people (men) aren’t necessarily interested in trying new things, nor are they interested in using social media. These people will keep on doing what they’ve always done. It’s the next cohort that needs to be corralled into an arena of experimentation, information dissemination, excitement and camaraderie. That’s part of why I’m here, I guess. Very interesting – there are so many variables (rootstock, soil, climate zone, management practices) that it’s going to be really hard to tease apart cause and effect. But it’ll be a fun journey. I hope you keep posting your observations and pointers to other sources for this kind of information.